Photograph of Larry Perkins and Dennis Jameson conferring a degree on one of the ACTS graduates ; Registrar Wendell Phillips is at the podium. 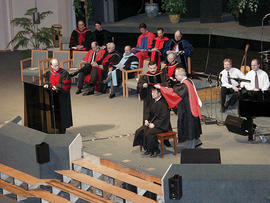 Photograph of Larry Perkins and Dennis Jameson conferring a degree on one of the ACTS graduates; Registrar Wendell Phillips is at the podium. Photograph of members of the platform party standing and singing during the convocation ceremony. Those pictured include Wendell Phillips, Guy Saffold, and Neil Snider. Photograph of ACTS Registrar Wendell Phillips - a close-up portrait shot. Photograph of Daryl Busby, President of the Canadian Baptist Seminary. A close-up portrait shot. 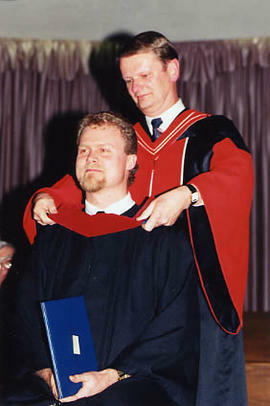 Photograph of Phil Zylla, the first full-time Principal of the Associated Canadian Theological Schools (ACTS), beginning in October, 2001. A close-up portrait shot. Photograph of administrators and staff of ACTS (Associated Canadian Theological Schools) standing below the "ACTS Centre" sign.